A charming and important early nineteenth century view of Windsor Castle by the master of the genre, Paul Sandby, is one of the major lots at Bonhams sale of selected contents of Hooton Pagnell Hall in London on 1 December. It is estimated at £40,000 – 60,000. 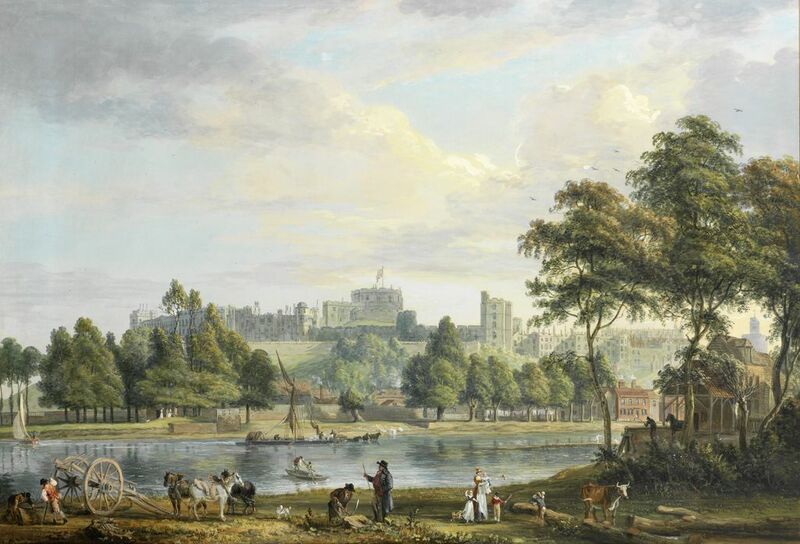 Windsor Castle from the Thames with figures in the foreground was painted in 1802 and bears a striking resemblance to Sandby’s picture in the collection of Her Majesty the Queen, Windsor Castle from the Eton Shore. The view from the Thames, however, has some wonderful enlivening human touches; a group of working horses, the young family with their scampering dog, the laden barge and the horse-drawn cart that has been driven into the river to receive its cargo. Sandby provides a snapshot of Georgian life against the backdrop of the awe-inspiring castle with all the historic connotations it would have held for 18th century antiquarians. In a long, fruitful career, Sandby (1730 – 1809) travelled the length and breadth of England and Wales achieving great success for his watercolour depictions of the architectural heritage of the land. A dozen veteran cars head to Bonhams 101 New Bond Street headquarters, ready for the annual London to Brighton Run Sale. Now entering its 12th year, the auction offers an incredible selection of veteran motor cars, this year starring the 1903 Clement Model AC4R Four-Cylinder Rear-Entrance Tonneau, estimated at £400,000-500,000. One of the most advanced cars of its day, the Clement has a long known British history, now returning to the UK from American ownership. Its very earliest days were recorded in the programme for the London to Brighton Run in 1934. The auction also boasts a magnificent 1904 Napier Model D45 12HP Side-Entrance Four-Cylinder Tourer, one of the few Napier models that were assembled in period in America. It has been part of three major international car collections, has four cylinders, a four speed gearbox, carries five passengers, is exceptionally rare and comes with an enviable record of completed Brighton Runs. It is now offered at an estimate of £350,000-400,000. Further automotive masterpieces from across the century and beyond include a 1904 Columbia Mark XLIII Two-Cylinder Rear-entrance Tonneau, estimated at £90,000-110,000, and what was commonly regarded as America’s premier make of petrol motor car, a 1904 Winton 4¼-Litre 20hp Two-Cylinder Detachable Rear-Entrance Tonneau, estimated at £130,000-160,000. Held on 30th October at Bonhams flagship showroom on 101 New Bond Street, the annual London to Brighton Run Sale will offer over 100 lots of both veteran motor cars and automobilia. Bonhams sale takes place during ‘London Motor Week’ – a series of events hosted by the world famous Royal Automobile Club which also includes the London to Brighton Veteran Car Run, a Literary Festival, Motoring Forum and the Regent Street Motor Show. The first Run took place in 1896, and since then it has taken place almost every year since its 1927 revival. For the fourth edition of the fair, the world’s leading galleries will present an unrivalled quality, breadth and depth of work, from highly collectible objects to significant masterpieces. In the main section of Frieze Masters, galleries continue the fair’s tradition of ambitious curated presentations, including solo exhibitions by modern mas- ters Frank Auerbach (Marlborough Fine Art, London), Sam Gilliam (David Kordansky Gallery, Los Angeles), Richard Hamilton (Alan Cristea Gallery, London), Carmen Herrera (Lisson Gallery, London), Roy Lichtenstein (Castelli Gallery, London), Michelangelo Pistoletto (Galleria Continua, San Gimignano) and Kwon Young Woo (Tina Kim Gallery, New York & Kukje Gallery, Seoul), among others. Andrew Edmunds (London) will present a monograph of works by 18th-century caricaturist James Gillray; whilst Les Enluminures (New York), taking part in the fair for the first time, will showcase Medieval and Renaissance manuscripts and finger rings, including one of the last richly illuminated manuscripts of Guillaume de Lorris & Jean de Meun’s Roman de la Rose remaining in private hands. Richard Nagy Ltd (London), also new to the fair, and Richard L. Feigen & Co. (New York), will transform their stands into atmospheric interiors, richly curated to invoke historical periods or specific places. Once again, Helly Nahmad is working with a set designer on a spectacular presentation. The new feature section Collections, curated by Sir Norman Rosenthal, will introduce various types of work to the fair, from an impressive selection of Japanese netsuke (Sydney Moss, London); to a 40-piece display of Ital- ian maiolica from the 15th to 17th centuries (Bazaart, London). It will also include a collection of rare wooden Egyptian sculpture, including an exceptional large statue from the Fifth Dynasty (2500-2400 BC) (Sycomore Ancient Art, London). In 2015 Frieze Masters Talks expands to feature nine conversations, co-programmed for the first time by Jennifer Higgie (Co-editor frieze and Editor, Frieze Masters magazine) who joins Jasper Sharp (Adjunct Curator of Modern and Contemporary Art at the Kunsthistorisches Museum, Vienna). Frieze Masters Talks is supported by Gucci, Associate Sponsor of the fair. 2015 participants include artists Michaël Borremans, Abraham Cruzvillegas, Ellen Gallagher and Lawrence Weiner, in conversation with museum curators Wim Pijbes (General Director, Rijksmuseum, Amsterdam), Frederick Ilchman (Chair, Art of Europe at Museum of Fine Arts, Boston), Dr. Minna Moore Ede (Assistant Curator of Renaissance Paintings, National Gallery, London) and Colin Wiggins (Special Projects Curator, National Gallery, London). Five new panels exploring specialist sections of the fair and wider themes of collecting, curating and writing will feature Tomilson Hill (collector), Ali Smith (writer), Mark Godfrey (Senior Curator, International Art, Tate Modern, London), Melvin Edwards (artist), Pamela Joyner (collector) and Sjarel Ex (Director, Museum Boijmans Van Beuningen, Rotterdam), among many others. At Frieze Masters, visitors will find some of London’s favourite bars and res- taurants. The Arts Club joins the fair for the first time, expanding from May- fair with a pop-up bar offering cocktails, wine and Champagne. Michelin- starred Locanda Locatelli will return to the fair for a fourth consecutive year, alongside Umu which has just received its second Michelin star. For more informal dining, GAIL’s Artisan Bakery will offer fresh, seasonal options. Opening alongside the contemporary fair Frieze London, Frieze Masters will take place 14–18 October 2015 in The Regent’s Park, London. Together the two fairs offer an unmissable opportunity to view, experience and acquire art. Frieze Masters is sponsored by Deutsche Bank for the fourth consecutive year, continuing a shared commitment to discovery. For regular updates on all the fair’s news, follow on Facebook, Twitter and Instagram. As the momentum builds for the inaugural ArtBahrain – the international art fair in Manama, Bahrain – has announced ArtBahrain Talks, its in-depth education forum and a VIP programme. ArtBahrain Talks and the VIP programme will be headed up by Janet Rady and Renaud Siegmann respectively, bringing their wealth of experience to the Middle Eastern art market. Rady’s ArtBahrain Talks will include daily guest speaking slots delivered from some of the participating international and Bahraini artists at ArtBahrain, consisting of three sessions of talks, discussions and presentations per day from 13 – 15 October 2015. Designed for a small group of VIP participants, the sessions will highlight topics including collecting art, the preservation of art and sharing/patronage of the arts. These workshops will be followed by individual MENASA artists’ presentations who will showcase their practice. The speakers will be drawn from a range of international and regional specialists and each will give an opportunity to engage with the other and to enrich their knowledge base in the context of a Bahraini forum. Artists participating at the ArtBahrain Talks panel discussions include artists Elisabeth de Bolza, Zoulikha Bouabdellah and Bassam Kyrillos. Workshops will be held by speakers such as Francesca Polo, Executive Director of Vastari, Pierre- Olivier Baudot of Baudot Patrimony, an investment fine art and collectables company, and Priya Khanna, an Indian art restorer. Meanwhile, Siegmann’s tailored VIP programme will aim to give visitors an expansive insight into the artistic history and culture of Bahrain, with a guided tour throughout the entirety of the fair. This includes visits to the Bahrain National Museum, the Bahrain Arts Society, the House of Qur’an and the Bahrain Fort. There will also be a VIP preview of ArtBahrain on 12 October 2015, one day prior to the public opening. ArtBahrain is preparing to host up to 200 international art collectors, 2,000 VIP clients and approximately 10,000 visitors. The event is set to be a culminating point for artists, art collectors and art lovers. ArtBahrain will take place from 13 to 16 October 2015. Etchings by Rembrandt made more than £350,000 at Bonhams Prints and Multiples sale in London last week (14 July). All 31 prints by the artist in the sale found buyers. Sixteen works from a distinguished Irish collection were sold for £250,250. They included The Three Trees, regarded as Rembrandt’s most consummate and acclaimed etching, which was bought for £65,000 and Self Portrait Leaning on a Stone Sill, one of the most splendid of the artist’s thirty-two self-portraits, which sold for £32,500. Abraham’s Sacrifice from the collection of Liuiba and Ernesto Wolf was sold for £13,750 and, from a different collection, a fine impression of Christ Healing the Sick known as ‘The Hundred Guilder Print’ made £22,500. The most ambitious and celebrated of Rembrandt’s religious compositions, depicting four episodes from St Matthew’s Gospel, this print was particularly sought after during the artist’s lifetime when impressions changed hands for 100 guilders, earning the work its nickname. David Hockney stars over the summer at Annely Juda, Dering Street. 16 standard size and 4 large iPad draings from the Arrival of Spring series. First seen at the Royal Academy in 2012. Erskine, Hall & Coe presents a solo show of Gordon Baldwin’s sculptural ceramics, featuring 25 works dating back to the early 1970s. Tornabuoni Art have just announced the opening of its sixth gallery, with a new space in London’s Mayfair scheduled to open in October 2015.
via NEW: Art Gallery to open in Mayfair London. | FAD Magazine. A bronze statue worth £40,000 has been stolen in a brazen daytime raid on an art gallery in London’s exclusive Mayfair district. Detectives in Westminster have appealed for information and released a CCTV image of a man they want to trace in connection with the incident. via Bronze statue worth £40,000 stolen in brazen daytime raid in Mayfair – Crime – UK – The Independent.